Rabbit anti Beta amyloid antibody (AHP677) used for the demonstration of total amyloid load in mouse brain by immunohistochemistry on free floating tissue sections. Total Aß load is reduced following intracranial administration of intact anti-Aβ antibody and deglycosylated anti-Aβ antibody. Panels B, D, and F show total Aβ immunostaining in the left (untreated) hippocampal regions of 20 mo. old APP transgenic mice. Panels A, C, and E show total Aβ staining in right hippocampal regions of 20 mo. old APP transgenic mice receiving intracranial injection of control antibody (panel A) or anti-Aβ C-terminal antibody (2H6; panel C), or deglycosylated anti-Aβ C-terminal antibody (de-2H6; panel E). Magnification = 40×, scale bar = 50 mm. Panel G shows quantification of the Aß load as the ratio of injected (right) side to uninjected (left) side for both the hippocampal and frontal cortical injection sites * indicates P<0.05 compared to mice injected with control IgG. From: Carty NC, Wilcock DM, Rosenthal A, Grimm J, Pons J, Ronan V, Gottschall PE, Gordon MN, Morgan D.
Intracranial administration of deglycosylated C-terminal-specific anti-Abeta antibody efficiently clears amyloid plaques without activating microglia in amyloid-depositing transgenic mice. J Neuroinflammation. 2006 May 10;3:11. Rabbit anti Human beta amyloid antibody recognizes the beta amyloid (1-42) peptide, the main constituent of amyloid plaques in the brains of Alzheimer's disease patients. Similar plaques appear in some variants of Lewy body dementia and in inclusion body myositis, a muscle disease (Benveniste et al. 2015). Beta amyloid also forms aggregates coating cerebral blood vessels in cerebral amyloid angiopathy (Kirshner et al. 2015). 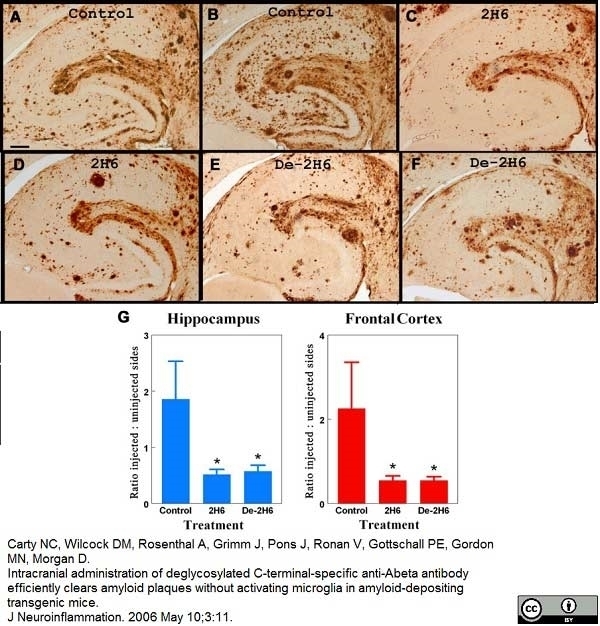 Rabbit anti Human beta amyloid antibody (AHP677) may be used in immunohistochemical staining of Alzheimer's disease plaques. Antisera to Beta amyloid (1-42) were raised by repeated immunisations of rabbits with highly purified antigen. 1This product requires formic acid pre-treatment of paraffin sections. Bertrand, E. et al (2008) Amyloid angiopathy in idiopathic Parkinson's disease. Immunohistochemical and ultrastructural study. Carty, N.C. et al. (2006) Intracranial administration of deglycosylated C-terminal-specific anti-Abeta antibody efficiently clears amyloid plaques without activating microglia in amyloid-depositing transgenic mice. Jeffrey, M. et al. (2015) Membrane pathology and microglial activation of mice expressing membrane anchored or membrane released forms of Aβ and mutated human Alzheimer's precursor protein (APP). Neuropathol Appl Neurobiol. 41 (4): 458-70. Jeffrey M et al. (2015) A Naturally Occurring Bovine Tauopathy Is Geographically Widespread in the UK. PLoS One. 10 (6): e0129499.